I am a very simple gal. I would rather be in the woods than in a shopping center. I would rather wear hiking boots than high heels. My taste in art runs on the folksy and homey side. So, when I started noticing painted quilt squares on buildings throughout the 501, I was in love! I was so pleased to find that Arkansas, including two counties in the 501, now have quilt trails. A quilt trail is made up of painted quilt squares that are found at various locations along a designated route. They may be painted on wood or metal and hung on a building. Many of these lovely examples of art are inspired by early settler quilt patterns when quilts were a necessary household item. Others are inspired by the painter’s family history, occupation, interest and even hobbies. They are found on homes, stores, barns, marinas, historical building and out buildings. Painted quilt squares in Van Buren County, at Fairfield Bay. Here’s a little bit about the history of painted quilt squares. Barn quilt squares came from the colonists in New England. The tradition has continued with the Pennsylvania Dutch Community as a way to celebrate their heritage. Originally, barn squares were designed to beautify barn exteriors. In the past, popular barn quilt squares were based on traditional quilt blocks such as log cabin blocks, bear paw or the wedding ring pattern. 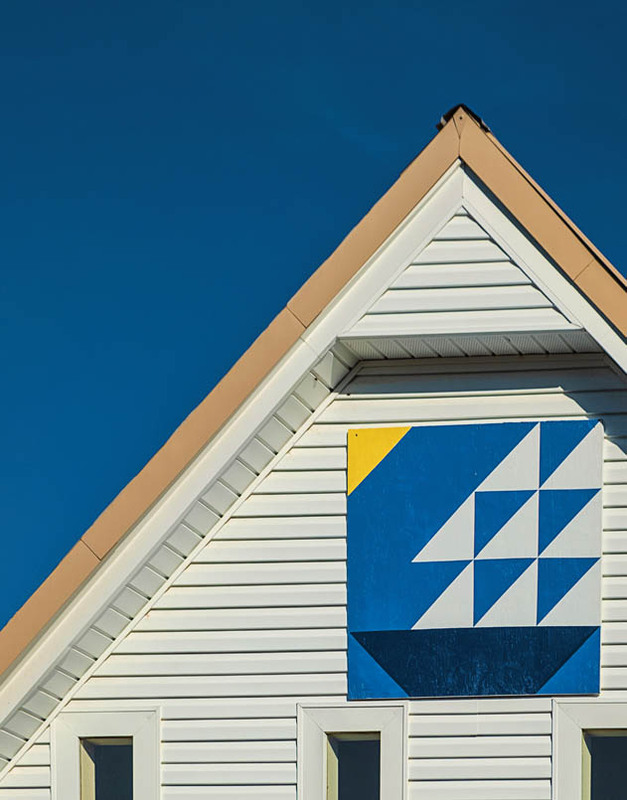 In 2001, a quilter in Ohio wanted to honor her mother with a painted quilt square on the family’s barn. The idea caught on and painted quilt squares begin to appear all over Middle America. These oversize roadside quilt squares combine symbols of rural America, barns, quilts and artwork. Rapidly, trails were developed to promote tourism in rural areas and on scenic routes. 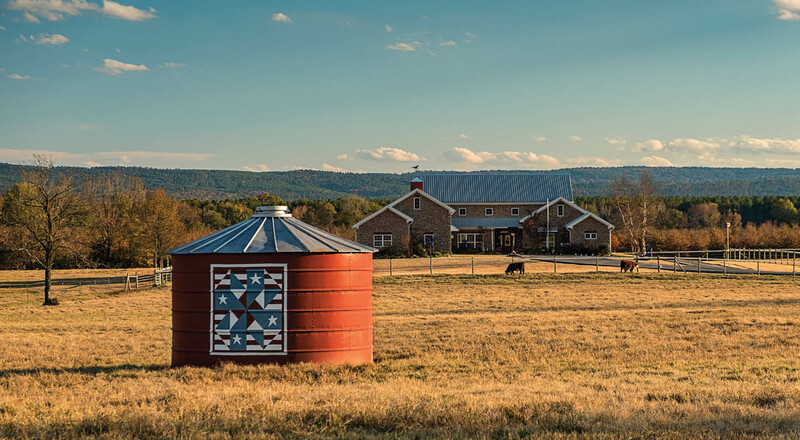 The quilt barn movement has now spread to 44 states and Canada. Many communities are involving many different groups from the elderly to children to create and paint the squares. Reproductions of squares are being made into cards and canvas to be sold at local gift shops to raise money for historical museums and commissions. Rural entrepreneurs have used them to launch farm-based businesses, like corn mazes, pumpkin patches and roadside fruit stands. Many trails now include art galleries, gift shops, wineries and other explorer points of interest. Currently, there are at least 11 painted quilt blocks throughout Van Buren County and 13 in Perry County. Each of the blocks, along with its story and address, is featured on the Arkansas Quilt Trails website (ArkansasQuiltTrails.com). Blocks vary in size but most are 4 feet by 4 feet. Their designs range from traditional to bright colors with bold contrasting patterns. Quilt squares in Perry County at the Double D Lazy T Ranch west of Perryville. The majority of Van Buren County squares are found in Downtown Clinton and between Shirley and Fairfield Bay. One of my favorites is on Highway 16 in Fairfield Bay. It was painted by Anna Massey. Her inspiration for the square was a wedding ring quilt her grandmother gave here as a wedding gift. The square is attached to an old barn in a beautiful country setting. Perry County squares are concentrated in the Perryville area. My favorites were found on the Double D Lazy T Ranch west of Perryville. The squares found in this location have a patriotic theme or traditional quilt patterns. The squares are not only increasing tourism to areas of the 501 that will benefit from travelers but they are also preserving history. These squares help to maintain the history of the area or the life story of a 501 family. Nowadays, very few people create fabric quilts. I am so happy that it is being revived in Central Arkansas with paint and being displayed on buildings with significant history or to decorate a modern building in a traditional way. So, take a day long journey, eat at a Mom and Pop diner, buy gas from a local station and celebrate our Arkansas history by following the Arkansas Quilt Trail. The colorful patterns make a delightful backdrop to a scenic country drive or a visit to one of the 501’s small towns. I hope more families within the 501 will become interested in telling their stories on quilt squares and as we travel the 501, we see more painted quilt squares popping up on barns and other buildings. I am even toying with the idea of designing my own quilt square and displaying it on our family’s barn or schoolhouse in rural Van Buren County. If you are interested in more information about the Arkansas Quilt Trail, visit ArkansasQuiltTrails.com. There is also an Arkansas Quilt Trail brochure at Arkansas Welcome Centers and chambers of Commence.